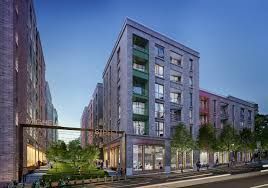 A stunning selection of 168 new build apartments are now available to buy or rent off-plan in Edward Street Quarter following the announcement of a £120 million development of the former Amex House site in the heart of Brighton’s city centre. The stylish new development will offer potential residents a selection of one, two or three-bedroom flats as well as offering them a combination of tenures from private sales, to build to rent and affordable housing. Edward Street Quarter, however, will not only deliver one of the most exciting residential developments Brighton has seen for many years, but it will also bring over 2000 jobs into the city through the development of 170,000ft2 Grade A office, leisure, and retail space. This space will bring in well-known high street brands as well as a wealth of independent businesses to the area too and so creating its own signature atmosphere and further complimenting the vibrant landscape of the city. Brighton & Hove Council approved plans for this “mixed-use” scheme back in July 2018 with the developers First Base and Patron Capital and it is safe to say that community is at the very heart of the scheme as the developers have designed the plans for the site in conjunction with local residents, businesses, community representatives as well as the city council. This community vision along with the design by Buckley Grey Yeoman has resulted in the Edward Street Quarter development truly reflecting the very unique vibe of Brighton and its eco credentials will be at its core as it will also introduce a new greener landscape. The developers have renowned landscape designers, Spacehub, on board to create three new green public spaces which will result in the planting of no less than 130 new trees and 45 plant species. This new development is truly going to reshape the vision of life in the area for the future. Edward Street Quarter is certainly delivering on every level as with its central location it will offer to residents and businesses alike access to Brighton’s vibrant cultural heart, stunning coastline and bohemian Kemptown area yet all within easy reach of the city’s train station. The developers have appointed Oakley Property and Currell (now part of Savills Group) as residential agents to bring their expertise in the Sussex and London property markets respectively to the development of the new scheme. Prices for the properties are yet to be confirmed but we believe that demand will undoubtedly be high given the buzz around this development already so visit www.edwardsstreetquarter.com for more information or contact us here at Oakley Property on 01273 688881 to register your interest.